I am still playing along with the SCS Dare to Get Dirty Challenge. This is for SusieAustralia's challenge. I had fun using an acetate overlay that I purchased a long long time ago from Prickley Pear. I made a background using AI Splash- where you drip Alcohol Inks onto glossy cardstock, and then you use an airbrush to spread the ink alone. The sentiment is by Create with TLC. The cardstock is SU Certainly Celery. 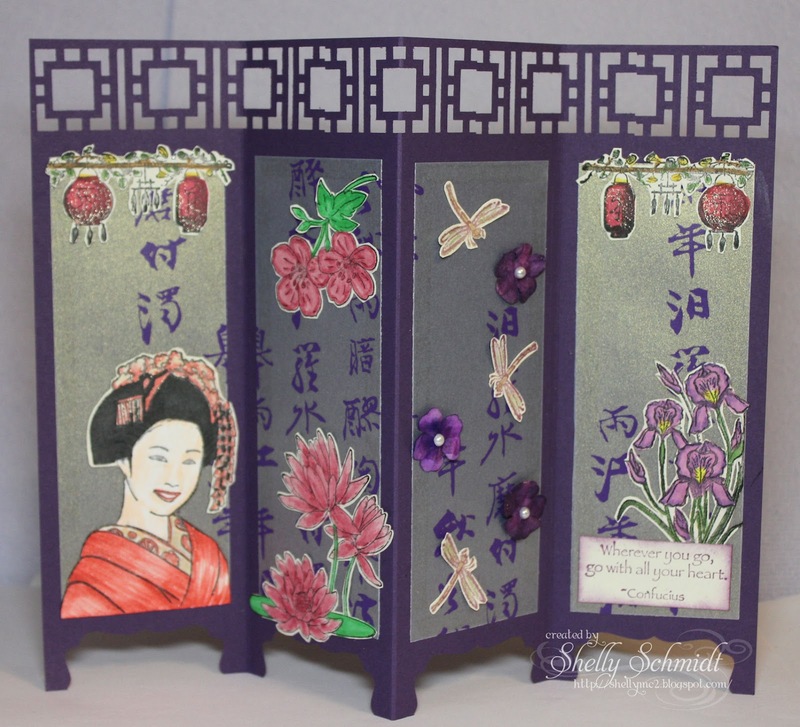 I made this Asian Screen card for dual duty... 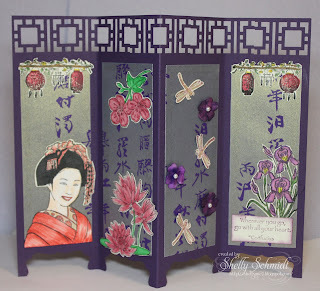 I have a Screen Card mingle in the About Oriental Art Yahoo Group, and I am also playing in Day 1 of Dare to Get Dirty at SCS. I used a full piece of SU cardstock, scored at 2.75", 5.5" and 8.25". I had a piece of metallic vellum with Japanese Kanji on it, I cut 4 pieces of 2.25" x 6" pieces for the panels. I used a SU punch for the bottom and an EK punch for the top of the card. 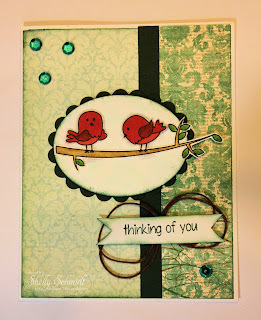 I added a touch of sparkle using a Sakura Gelly Roll pen. 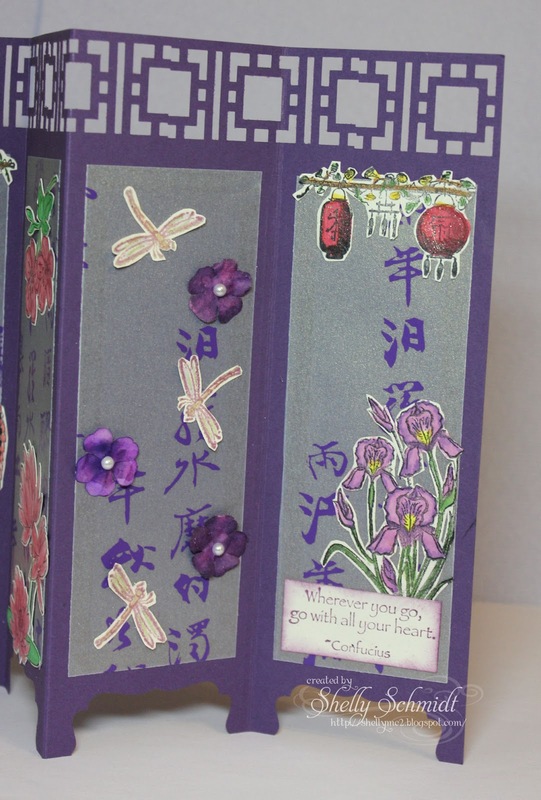 The dragonflies are embossed with Sparkle EP and colored with Copic glitter pens. 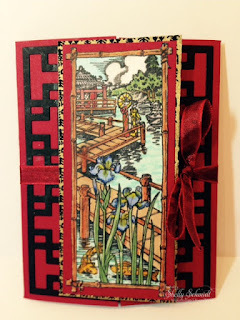 Iris- About Art Accents, Sentiment-SU, lanterns ? In the About Oriental Art Yahoo Group, we had an image swap- we had to make a card with the image and send it back to our partner, Fun, huh??? 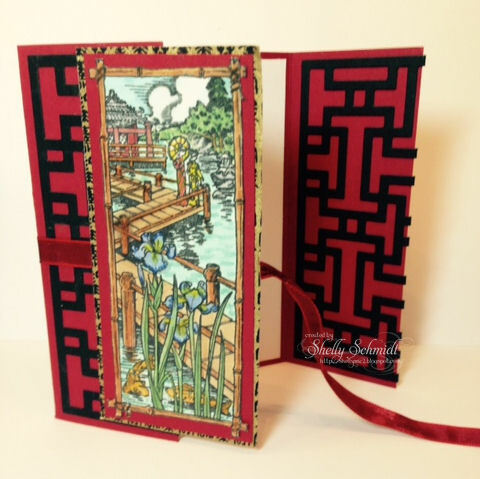 I received a beautiful image (from I Brake for Stamps- on sale now too : 0 ) from Carolyn S. It is a Japanese garden, but reminds me of the Yu'an gardens in Shanghai. I really love the image. I colored it with Copics, then matted it with Washi Paper. 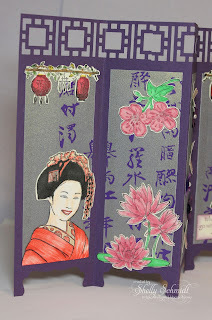 I used a die, Oriental Screen by Die-versions- I folded it in half, and applied 1/2 of the image to the front and inside of each panel, then the ribbon was added to keep the card closed. 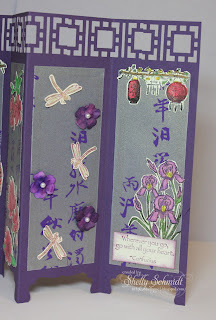 Oh the card I got back from Carolyn S is a beauty, and a card I am going to try to recreate soon! This card is glittery shimmery heaven! 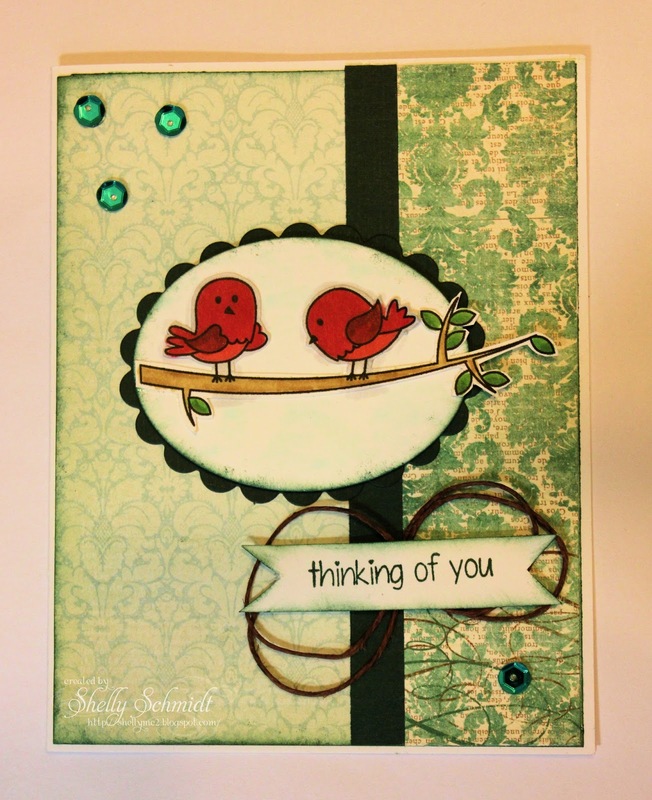 The bird image by Stonehouse Stamps- plate #6 is fussy cut and added to a DP background. 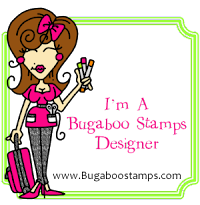 Welcome to the Create with TLC Vintage Vacation Blog Hop. I have long been a huge fan of the Create with TLC digital images. 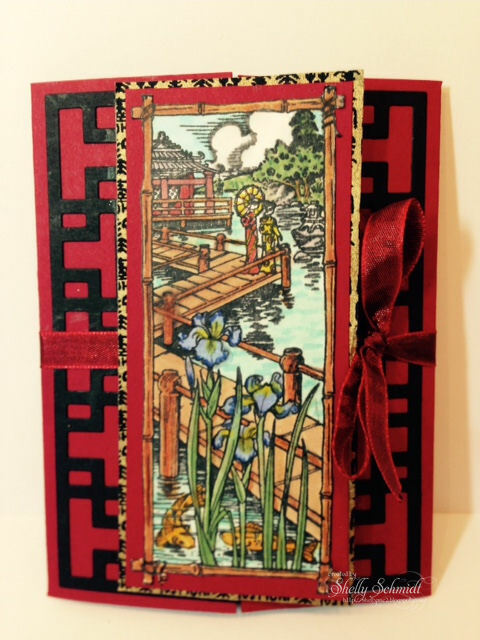 I so enjoy creating with the images and sentiments Paulette creates! I colored this image using Copics on White GP 110# cardstock. The remaining CS is all SU. I added a touch of white paint pen to the water. I used a portion of the sentiment- just the bottom segment. I popped up the Kraft layer on dimensionals, and I added twine and a vintage button to finish off the card. The girls umbrella is popped up on dimensionals. 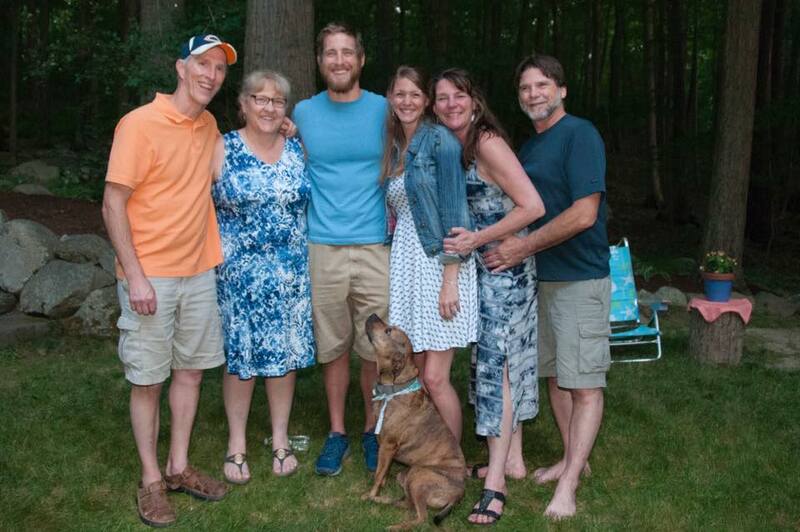 And, this is the best part about digi images- you can resize them to any size you like. I love to create ATC's, so here is my mini version, ATC size. Here are the images for my stop- just click on the image, Right click and Save as- then put into your file. 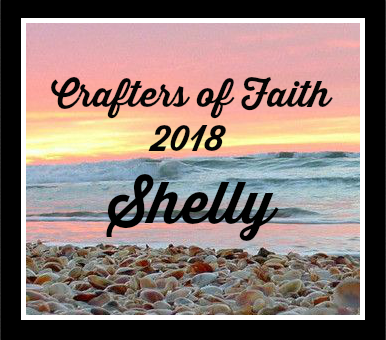 This is the Blog Hop order start to finish - Hop on over to the beginning of the Hop, and make your way through all of the stops, and enjoy some Vintage Vacation Goodness!!! Don't forget to stop over at Create with TLC and tell Paulette Thanks!!! I had fun with the shower and stamped up some goodies for each person. Remember back in the day when we stamped on label sheets??? This is 4 treat boxes together. I love how they turned out. 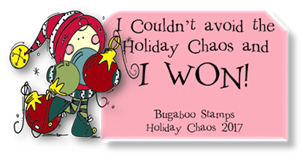 This is a page of labels- I stamped using a set called Always on my Mind from Sweet Stamps. There is also a small silver/gray wedding ring stamped on the labels from Paper Smooches. Next, I took small strips of Pool Party CS, and cut into pieces a pinch smaller than the clear box. Insert the dividers, then the candy-into the clear box. 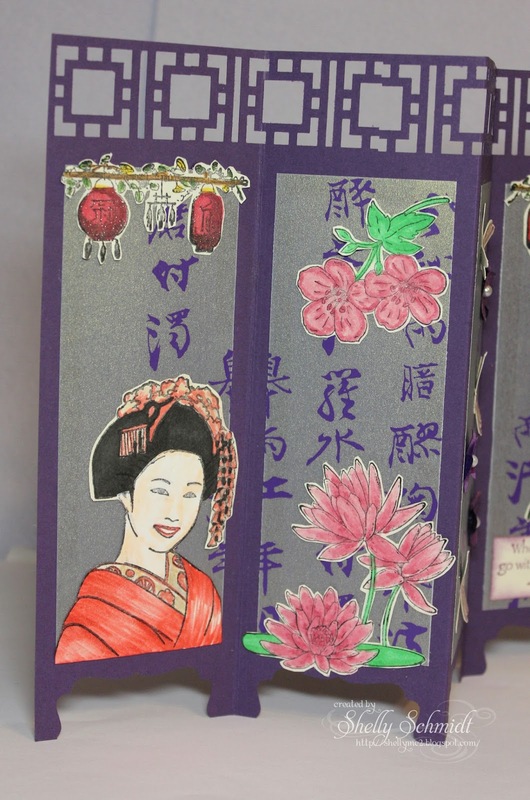 Here is the box (Denami Designs). 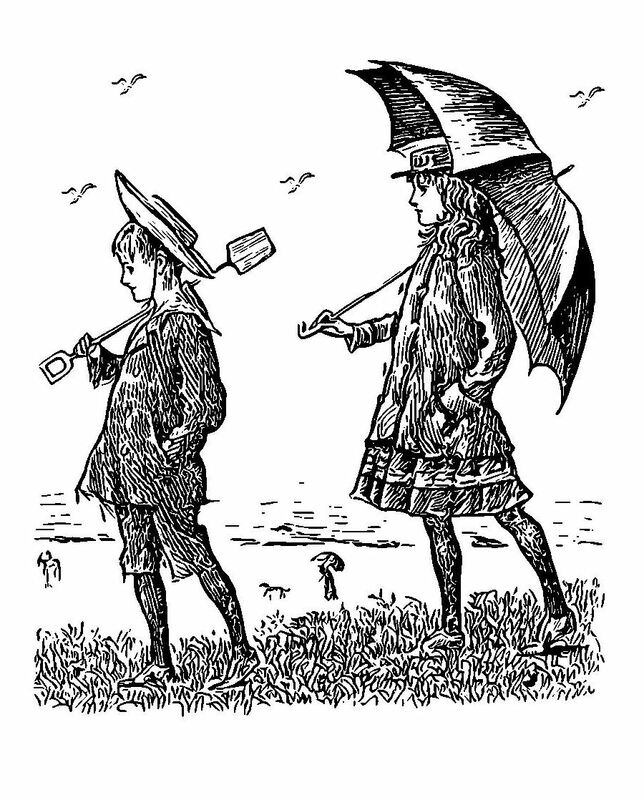 Stamps are the umbrella die are Paper Smooches. I gave in and purchased a MISTI- best tool ever. I had made my own with a CD case, it worked, but nothing like the real thing! Made stamping multiples a breeze! I set it up so I could stamp the front on the Lt and the inside on the Rt- really smooth! The cardstock is Pool Party from SU, silver and white GP. The cloud embossing folder is SU. We had a wonderful time at both parties! My back has calmed down a bit- off steroids now but still on muscle relaxants and in PT. I was advised to quit working, as I sit all day, and work on strengthening my core. Others with back issues can probably relate- the more the back hurts, the less you are wanting to do- to avoid hurting yourself...... So, I will work shortened shifts thru the end of the month, then I will be home.